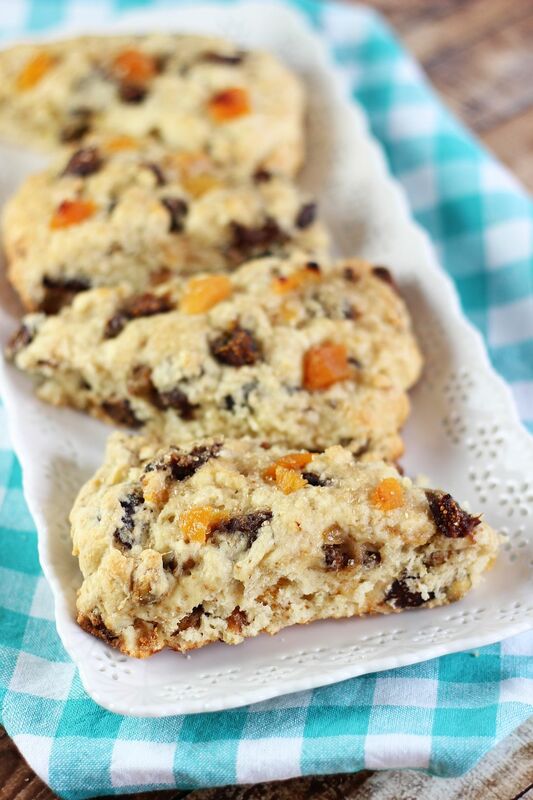 Tender and moist scones bursting with candied pistachios, apricots, and orange juice-soaked figs! 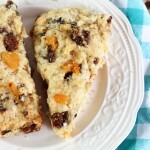 Fresh scones are surprisingly simple and quick to make! 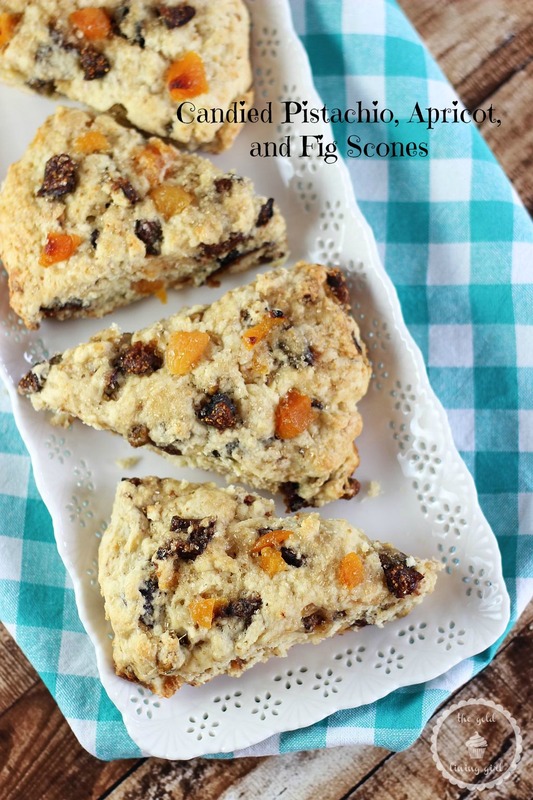 I have not posted a scone recipe in nearly three months, and seeing as though I’m getting the craving for more again, I thought I should get these posted and out of the way. They’ll be happening again very soon, and I don’t want to bore you with lack of variety. Too late? Also, I made these in JANUARY. I remember thinking they would be good to share around EASTER!!! Then Easter came and went, so I thought: okay, we’ll go with Mother’s Day as a brunch idea. That holiday is also long gone. 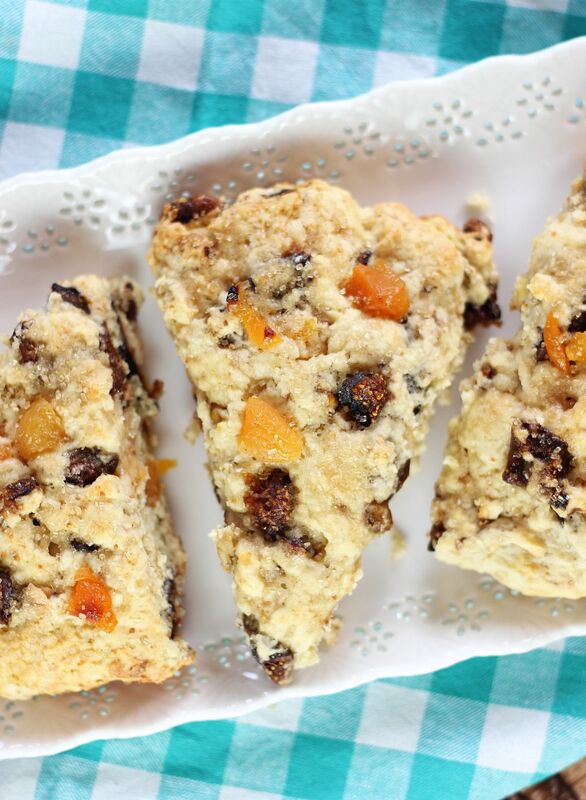 I *know* that with the arrival of June, you have scones on the brain. 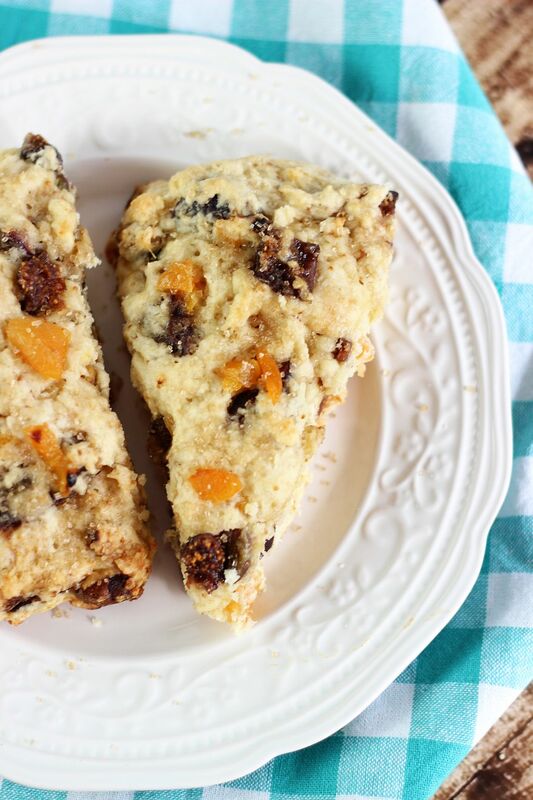 Summer and scones go hand in hand, don’t you think? Just smile and nod at the crazy lady, and maybe I’ll go away. Okay, I’ll go away, but FIRST…. If you still haven’t tried making scones from scratch, you really should. 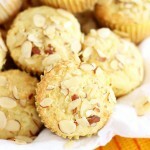 You’ll love the satisfaction of fresh baked goods in 30 minutes, start-to-finish. They’re so quick to have fresh from the oven, and it’s so gratifying to enjoy the fruits of your labor so quickly. And homemade scones are incomparable to any scone you can buy. This recipe is my favorite and I use it over and over again – they always turn out moist, flavorful, buttery, and tender inside with crispy edges. Perfection. I love figs and had a month-long obsession with them at the beginning of the year. Dried figs are delicious as is, but even better when soaked and plumped up by coffee or OJ or even bourbon. Something that provides a complementary flavor… OJ, in this case. These scones take a leeeeetle longer to make, technically, because you have to soak the figs, but that’s just idle time. 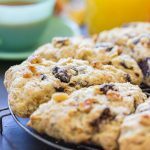 With plump and sweet dried apricots, candied pistachios, and orange juice-soaked figs, these tender scones are perfect for a spring brunch. 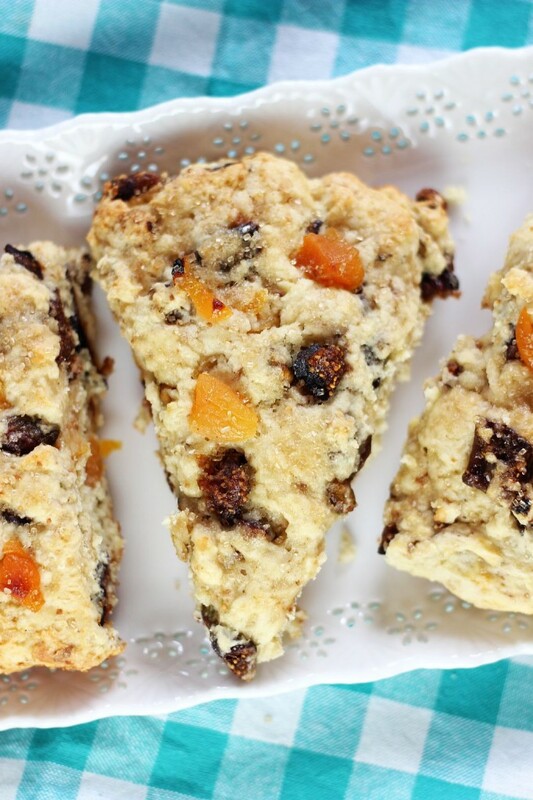 Tender and moist scones bursting with candied pistachios, apricots, and orange juice-soaked figs! Meanwhile, in a small bowl, combine brown sugar and water. Stir until sugar is dissolved. Add pistachios, and toss to coat. Spread pistachios on a well-greased baking sheet, and bake at 350 degrees for 5-7 minutes, or until they're golden and toasted. Allow pistachios to cool completely. Coarsely chop them, and set aside. In a small bowl, mix together eggs, cream, and vanilla. wow Sarah, love the flavors in these scones! 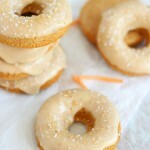 These would be so perfect with a cup of coffee. Seriously craving for one now! You’re on a roll, Sarah! Fluffernutter treats and now these scones! I love scones in just about any flavor. 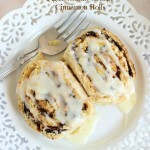 In fact, they’re probably one of my favorite breakfasts! This combination of ingredients is so unique and delicious. Pinned! 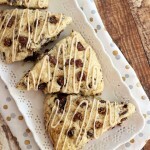 Loving all the flavors in these scones, Sarah! Simply put; yum!